Through the years of watching my wife watch Psych, when I started seeing ads on CBS for a show called The Mentalist, it looked more and more to me like someone liked the concept of the former and wanted to make a dramatic interpretation of the latter. And now that I have finally exposed myself to the latter in the form of the show's sixth season, it is pretty much what I expected. 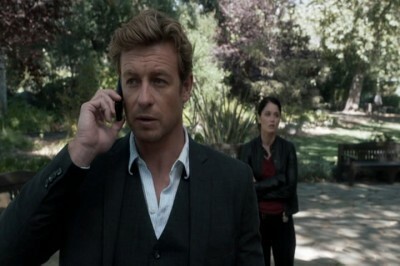 Said Mentalist is a guy named Patrick Jane (Simon Baker, The Devil Wears Prada). Jane was a psychic, but he decided to reveal that he was a fraud, in the wake of the murder of his wife. He decided to volunteer his services to the California Bureau of Investigation (which is a thing as I found out), and he helps them with cases, using his keen observational, non-psychic senses, and also tries to figure out who killed his wife, other than an ominous person named "Red John." The sixth season finds him transitioning to working for the FBI in a similar role, along with bringing along agent Teresa Lisbon (Robin Tunney, Empire Records), the only one seemingly capable of keeping Jane reined in as much as possible. Along with the job change, the show undergoes a location change as well, going from Sacramento to Houston, Texas. As well, the addition of Rockmund Dunbar (Sons Of Anarchy) to the cast as the section chief of the FBI seems to boost confidence. Rounding out the members of the team are Kimball Cho (Tim Kang, Rambo), Wayne Rigsby (Owain Yeoman, Troy) and Grace Van Pelt (Amanda Righetti, Role Models). So for those who are familiar with Psych or even Monk, law enforcement takes Patrick Jane's contributions and go to a whole new level. He can hire garbage trucks or marching bands playing "The Yellow Rose of Texas," or getting possibly the best office in the Bureau building along with a comfy couch to boot. It is because he has supernatural skillz and he can have law enforcement exert all kinds of force to try and capture someone, only for it to be him in a limo with a cup of tea and/or a snappy expression. This is what people have liked or even enjoyed for six years now? At some point, you have to exert a little bit of disbelief when it comes to some of these stunts, yell ‘Come the Hell On!' and be skeptical of what the plan that The Mentalist has for audiences. As far as storytelling goes, with the news the show's seventh season would be its last, maybe the showrunners already knew the writing was on the wall and when it came to the main protagonist, the thought was to start wrapping the loose ends up. Jane finds out who is the mysterious "Red John" over the first half of the season, the show pulls up its roots and moves the cast to Texas, and the decision to write out a couple of the characters. Creatively that would seem like a challenging haul for any show to handle. Luckily for us, The Mentalist seems to lack some self-awareness to what it is doing, so when some things are not plausible, they fluctuate from dumb to downright silly so effortlessly. A guy halfway through the season is shot twice in the upper chest, definitely around the lung. Another guy comes in, gives him a third shot for good measure right in the heart, cut to seconds later the guy is moving around slowly like he fainted for a second. Moments later still, he gets up and delivers the fatal shot to the guy who shot him. I mean, unless a bag of PCP was consumed at some point over the previous 30 minutes, what the hell man? At this point, it seems like (in a vacuum, admittedly) that The Mentalist is relying on the charm of a guy who honestly is not all that charming, doing things that are predictable when they aren't swimming in fantasyland. I'm not going to lie, at the end of its run The Mentalist is looking at upwards of 150 episodes and that is was popular enough to enjoy those runs cannot be denied. But for the uninitiated, looking at this show, which was staking ground that had been previously set by another network and two other shows, I see this show and see not only what it was that The Mentalist was trying to accomplish, but how did it manage to do it considering how poorly it tells a story? Psych has a pineapple, Monk had Tony Shalhoub, and I am still trying to wonder what The Mentalist comes close to having. The sixth season of The Mentalist had a 22-episode run, spread over five discs, with four episodes each on the first four discs and the balance on disc five. The transfers all look sharp and have no edge enhancement (and minimal haloing) throughout the season. Colors are reproduced naturally and flesh tones are also natural with no color push or saturation issues to speak of. No artifacts plague this pristine transfer and this is about as good as a show is going to look on standard definition. Dolby Digital 5.1 surround for all episodes, and most of them are quiet dynamic. The haunting keyboard music cues sound clear and depending on the tone, even have some subwoofer engagement to them, even along with bombs that blow up a bus station. There are even moments of channel panning and directional effects in the rear channels as well. In quieter moments dialogue is well-balanced for most of the season's run. Pretty good stuff from Warner on these discs. 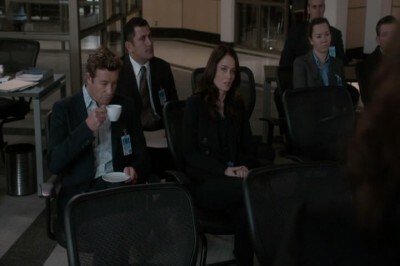 Five deleted scenes (9:14) which do not contribute anything memorable, and the only extras on Disc Five is "Patrick Jane: Recovered, Redeemed, Restored" (15:01), which examines the decision to "off" the big bad guy for the show and the cast and crew's thoughts on same. Some character arc and motivation discussed is touched upon, and the future of the show post-Red John, but otherwise, eh. More devoted fans of The Mentalist may be surprised or even a little glad to see some closure from the show's raison d'etre. As an outsider, I saw something that seemed to throw everything and the kitchen sink at the wall and seemed to pick something from random, kind of like that Simpsons "Treehouse of Horror" episode that picked a name out of a hat the one time. Technically, this is a sharp set of discs, and supplementally could have used a little bit of work. Fans of the show will enjoy it, but if you're looking for engaging entertainment, I would hesitate on buying anything.